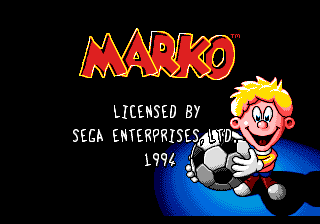 Marko's Magic Football, known simply as Marko in North America, is a 1994 platform game developed and published by Domark for the Sega Mega Drive, Sega Mega-CD and Sega Game Gear. The Mega-CD and Game Gear versions were released exclusively in Europe, though the Mega-CD port was unofficially brought to the US via Good Deal Games who started selling unlicensed reproductions sometime in the 2000s. In Marko's Magic Football you play as Marko, a football player who uses his football to complete various platforming tasks. A Sega Master System version was reportedly in development at some stage too, although was cancelled. Sonic the Comic included "Marko's Magic Football" comics strips. The single story arc was ruunning from issue #41 to issue #46. It's one of the few comic strips in Sonic the Comic that is based off 3rd party game. Main article: Marko's Magic Football/Magazine articles.